It was noted that "the Rukban camp is situated at the security area of Al-Tanf where a US military base is deployed"
MOSCOW, February 16. /TASS/. Two humanitarian corridors for refugees leaving Syria’s Rukban camp will be opened early on February 19, according to a joint statement of Russian and Syrian cross-ministerial coordination centers set up to facilitate the return of refugees released on the website of Russia’s Defense Ministry on Saturday. "As things stand, once again convinced that it does not seem possible to obtain any constructive position from the side of American partners, while further failure to take measures to solve the problems of the Rukban camp will only cause new civilian casualties, the Syrian government with the help of the Russian Federation has decided to open two humanitarian corridors on the border of a 55-kilometer zone (around Al-Tanf) occupied by the US in the Jleighem and Jebel al-Gurab settlements where respective checkpoints will be located allowing Syrian refugees to leave voluntarily, freely and safely for places of residence they choose," the statement said. 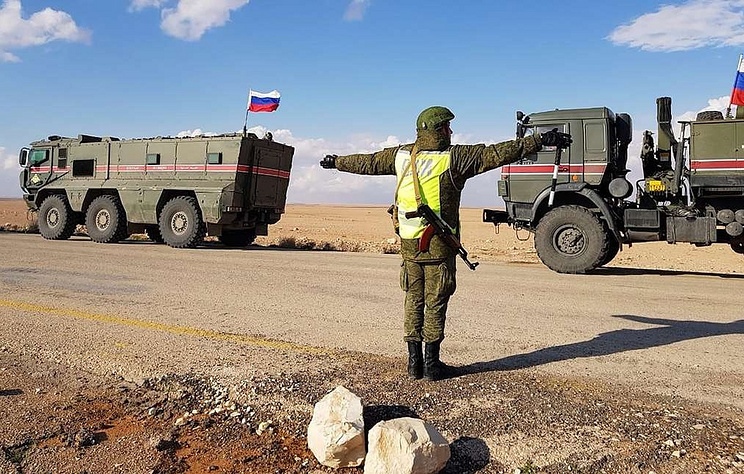 "The round-the-clock service of checkpoints to meet, accept, distribute and provide necessary assistance to internally displaced people leaving the Rukban camp will start at 9:00 a.m. Moscow time on February 19, 2019," the report added. It was noted that "the Rukban camp is situated at the security area of Al-Tanf where a US military base is deployed." "Opposition groups’ militants block the security area perimeter, not allowing the humanitarian aid of the UN and the Syrian government inside the camp. According to the World Health Organization, around 40,000 people are currently staying at Rukban, mainly women and children, while several people have died due to severe conditions," the statement said. Russian and Syrian cross-ministerial coordination centers set up to facilitate the return of refugees have urged the UN structures to join the operation moving refugees out of the Rukban camp, according to a joint statement. "We urge the structures of the United Nations Organization, including the Syrian Arab Red Crescent, to join the humanitarian operation, while American partners - to exercise good will in the interests of the suffering Syrian people," the statement said. The Rukban camp is situated at the security area of Al-Tanf where a US military base is deployed." "Opposition groups’ militants block the security area perimeter, not allowing the humanitarian aid of the UN and the Syrian government inside the camp. According to the World Health Organization, around 40,000 people are currently staying at Rukban, mainly women and children, while several people have died due to severe conditions.